With incredible visual additions such as genuine photographs and documentation from the wartime and beyond, Mr. Perlmutter has crafted a no-hold account of his life during WW11 and after. 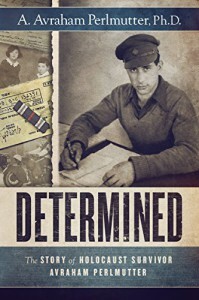 His memoirs does not emphasizes on the gruesome atrocities committed by the Nazis but rather focuses on the survival of one young man and how he made a successful life for himself in Israel and in the United States after the war. His account touches on some of the people who orchestrated his various escape or hid him from the Nazis. It is an important story that tells how determined even at a young age the need to survive by taking risks and keep pushing the limits in order to succeed. The first part of the book focusses on the kindness and generosity he experienced during the war and the multiple miracles that allowed him to survive. The rest of the book concentrates on what happened after the war. This moving story is unique both in content and in tone. His personal journey with detailed descriptions gives us a glimpse of his adventurous life filled with danger and risks and evokes the feeling of compassion as you walk in the shoes of a brilliant young man determined to survive. Although the book is a quick read it is also one difficult to follow. The narrative has a plethora of people to keep track of with names hard to remember. The timeline is inconsistent and all over the place for most part till it found a better rhythm then the words flowed at a steady and even pace. It is a bit of a choppy account but having said this, I nevertheless say that Mr. Perlmutter has an amazing memory to have given so many details while providing many photos and documents to support his words.